Free knitting pattern for a quick knit baby hat using Australian 12 ply yarn. 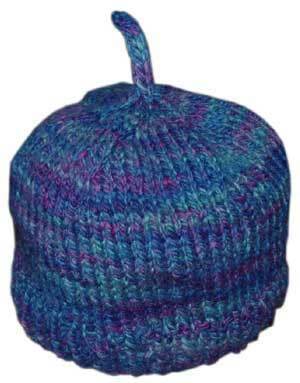 I originally designed this little baby hat to show the way the sample yarns in my tutorial on spinning handpainted slivers and rovings knit up. It turned out so cute that I decided to include the pattern as well! These hats only take me an hour to knit (and I’m a notoriously slow knitter), so they make great last minute baby gifts. I used handspun wool but you can use any commercial 12 ply yarn. Yarn: Approx 70m of 12 ply wool. I used 35gm of merino wool that I dyed and hand spun. Panda Magnum 12 ply (if you like acrylic). 1 x 100gm skein will make 2 1/2 hats. Using 4.5mm needle cast on 72sts and work 2.5cm k1, p1 rib. Change to 5mm needles and continue in stocking stitch (knit every round) until your knitting measures 9.25cm from the cast on edge. Knit icord on these 3 stitches for 5cm. Knit 3 together and fasten off. Darn in ends. Wash and block. 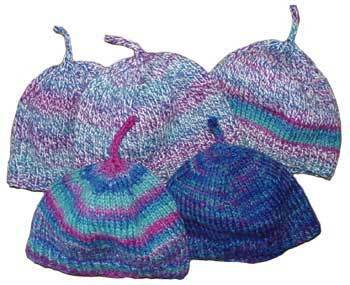 Note: Make sure you have enough yarn to knit more than one of these hats before you start as they’re quite addictive!